Montreal, Canada debuted at the 1996 Epcot International Food and Wine Festival. When one thinks of Canada a few things come to mind - hockey (ice), moose and maple leaves. Maple, one of the most delicious treats that I've found many uses for. Featured on the 2004 menu for Canada was this recipe. Generously butter an 8-inch square baking dish. Put maple syrup and cream in saucepan and bring to a boil over medium heat. Remove the pan from the heat and add butter, without stirring. When the fudge has cooled to 110º F, add the walnuts and beat vigorously with a wooden spoon until the mixture begins to lose its gloss and hold its shape. Turn the fudge into the prepared pan and allow it to cool for several hours. 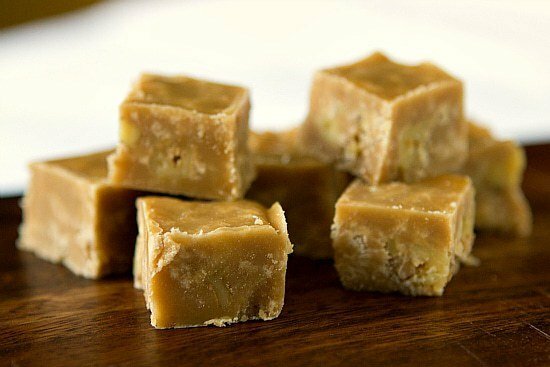 When the surface is firm to the touch, cut the fudge into 16 squares.